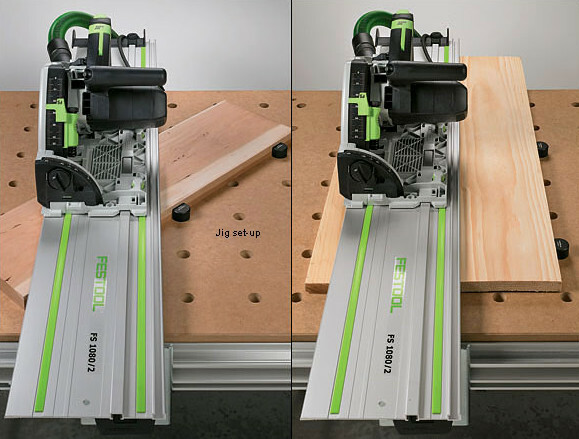 Named after their designer (Peter Parfitt), Parf dogs let you take advantage of the grid of the Festool MFT 3 multifunction table to set up accurate, repeatable cuts. The dogs come in two sizes – a 10 mm (just over 3/8 inch) tall small dog and the 70 mm (2-3/4 inch) tall Parf dog. 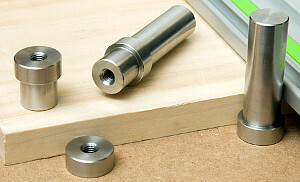 The part of post disappearing in the table is 17 mm long and must be added to the given measures above to meet the total length. By using a pair of small dogs to position your workpiece and a pair of Parf dogs to position the fence on top of it, you can easily achieve parallel or square cuts on the work. Veritas worked with Parfitt to improve his design and broaden its utility. Machined from stainless steel, the Veritas versions have a 19.90 mm diameter post that fits snugly in the 20 mm holes of the MFT 3. Each size of dog is supported on the surface of the bench by a thicker boss or collar, 25 mm (just under 1 inch) in diameter and 10 mm (just over 3/8 inch) tall, which provides a good bearing surface and stability in use. 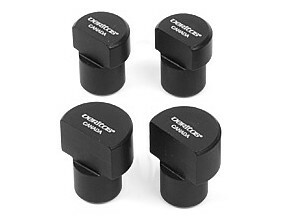 For additional security, each dog has a threaded hole (Thread M8) to fasten it from below the table with an MFT accessory clamping knob (not included) or the inexpensive star-shaped knob we offer separately. The two dogs can also be used as the starting point for a variety of different jigs. 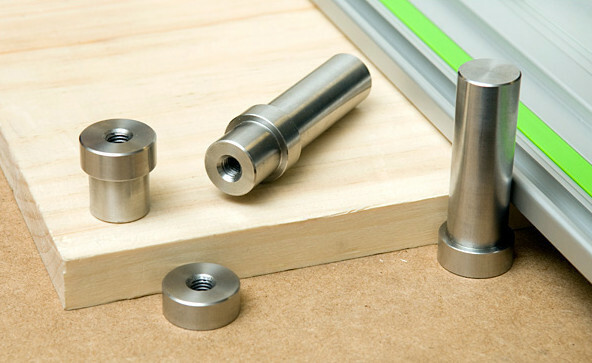 Aside from its use as a low-profile stop, the small dog can be set flush into a bench top or jig piece to exploit its M8 threaded through hole as an anchor point – the boss size was chosen to let you easily make a recess for it with a standard 25 mm (1 inch) bit. The Parf dog is 19.90 mm in diameter above its collar, matching its post. You can make a simple beam compass with a long board by drilling a 20 mm hole for the dog in one end and using a marking tool at the other. 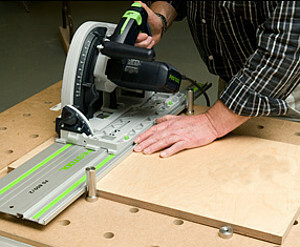 By replacing the marking tool with a router or jigsaw, a very stable and accurate trammel system can be created. Secure the parf dog with a clamping knob from the underside of the table-top. 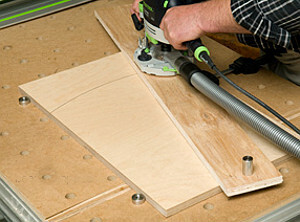 For table-tops with thickness 18 - 22 mm! CNC machined from aluminum, they have a flat face for work registration and a rim that supports and stabilizes them on the bench surface. Available in two sizes, a small dog with a 20.5 mm wide and 12.7 mm tall face and a large dog with a 27 mm wide and 17.5 mm tall face to provide extra support to thick stock. Their 19.81 mm root diameter is designed to fit 20 mm dog holes with slight variation due to swelling or wood movement. 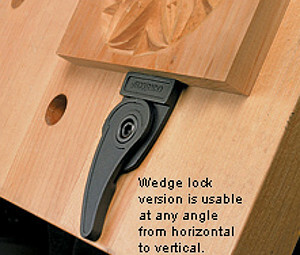 The posts resist horizontal force well, and are threaded internally so they can be held in place with a clamping knob (see our Code 325028) for added security. 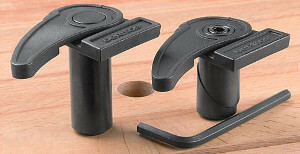 Either standard knobs made by Festool (not included) or our inexpensive star-shaped knobs (sold separately) can be used. Sold in pairs of small or large dogs. 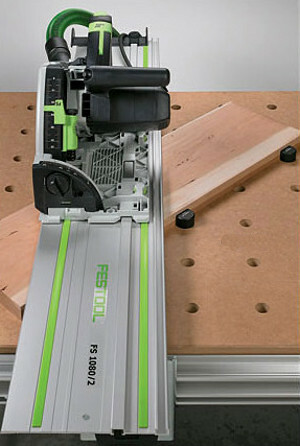 This is essentially a low-profile bench dog with a quick-release sliding jaw for holding work. Dubbed a "blade" due to its flat design, it projects just 1/4" (6.3 mm) above a work surface to permit maximum access to a workpiece. Used much like a toggle clamp, it has a thumb-operated eccentric cam lever to control the sliding jaw, so you can quickly secure or release work. With 1/4" (6.3 mm) range of travel, the jaw has limited throw, but applies up to 300 lb of clamping force. 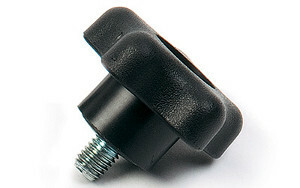 Flats on the cam provide secure stops at 1/8" (3.2 mm) and 1/4" (6.3 mm) of travel. 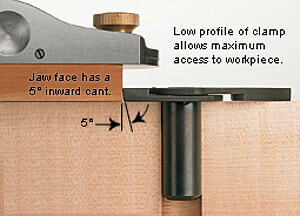 The jaw face has a 5° inward cant to help hold wood securely. The cam and jaw are cast steel, heat-treated for surface hardness, and the post and wedge-lock mechanism are turned steel. 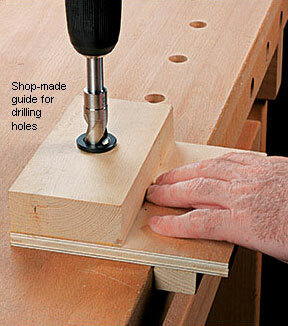 The standard post version is for use in a 20 mm diameter through-hole - or blind holes that are at least 48 mm deep. The wedge-lock version is usable at any angle from horizontal to vertical, and anchors firmly in any 20 mm diameter through-hole in material as thin as 16 mm (depending on the strength of the material), or in blind holes that are a minimum of 36 mm deep. 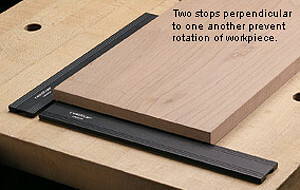 These low-profile work stops present a broad bearing surface. Particularly useful with thin or narrow workpieces, each 32 mm (1-1/4") wide anodized aluminum rail projects just 5.6 mm (0.22") above the bench top, allowing materials as thin as 6.35 mm (1/4") to be worked or planed without obstruction. 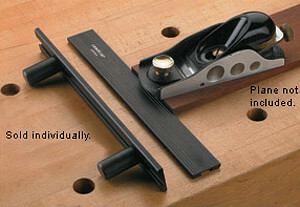 It also provides a reliable registration surface for materials too narrow to span two adjacent bench dogs. The two steel posts slide along a T-track on the underside of the rail; with posts sized to fit 20 mm diameter dog holes. The posts on the 248 mm (9-3/4") stop can be spaced up to 229 mm (9") apart (center to center); the posts on the 445 mm (17-1/2") length can be spaced up to 425 mm (16-3/4") apart. 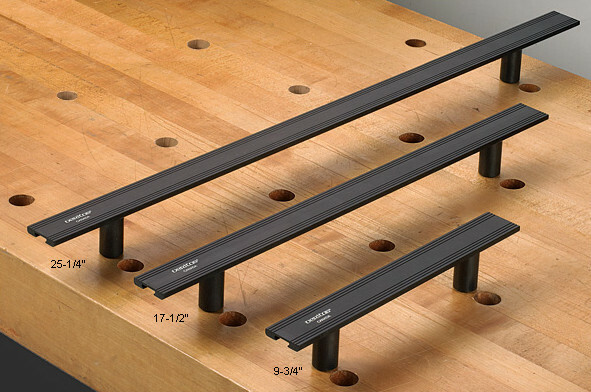 The posts of the 641 mm (25-1/4") stop can be spaced up to 622 mm (24-1/2") apart; at over two feet long, it will span the depths of most bench tops and can be cut shorter if desired.